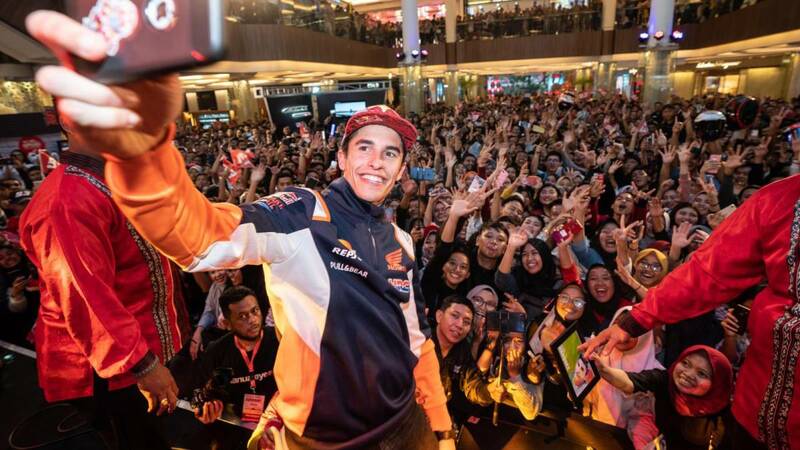 The champion has gone to Bandung, the third largest city in the country, for a Honda event and has caused delirium among its inhabitants. Gritos, pushes, tears, hot flashes, smiles ... and people, many people. The city of Bandung, the third largest in Indonesia, has been revolutionized these days. You breathe something special. Not every day a world star walks through its streets or goes to one of its shopping centers, so you had to receive him with honors. And that they have done, and effusively, with Marc Márquez. The heptacampeón of the world has traveled from Malaysia to Indonesia after the tests of Sepang by a commercial act of Honda and has unleashed an authentic madness in his step. Así has been in charge of show him the Repsol Honda in his different accounts of social networks and even he himself. There are numerous photos and videos in which you see the ilerdense surrounded by crowds and causing the delirium of its many fans in those lands, where as you can see is a real star. "Unforgettable sensations", that's how Marc describes his trip, in which he has been involved to the fullest by talking, dancing and posing where they said, and always with a smile. With so many samples of affection it is not for less.